Graphilo. The paper was designed (possibly by the Nagasawa people) specifically to work well with fountain pen inks and show off the properties of inks. 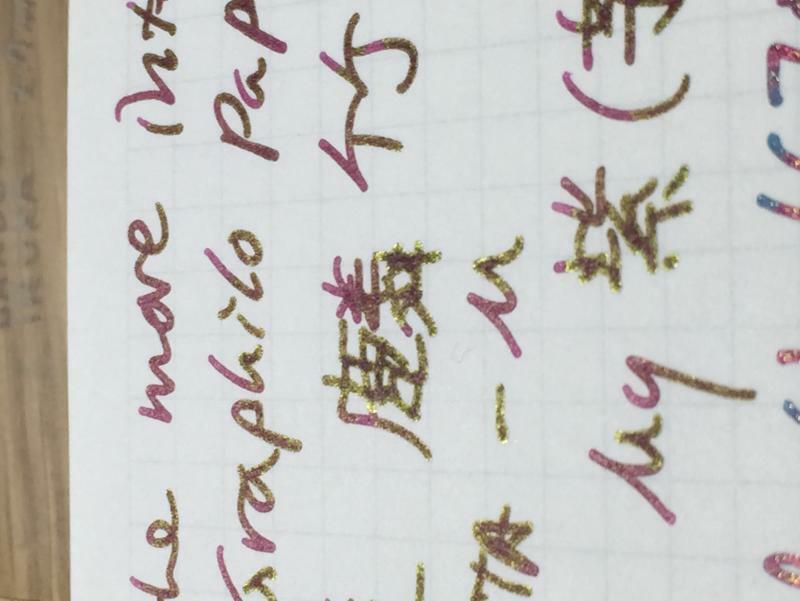 The first time I was able to see the different sheen properties of the "very much like Bung Box Sweet Potato Purple" ink that I had made for me at Sailor Ink Kobo was when writing on this Graphilo Paper. 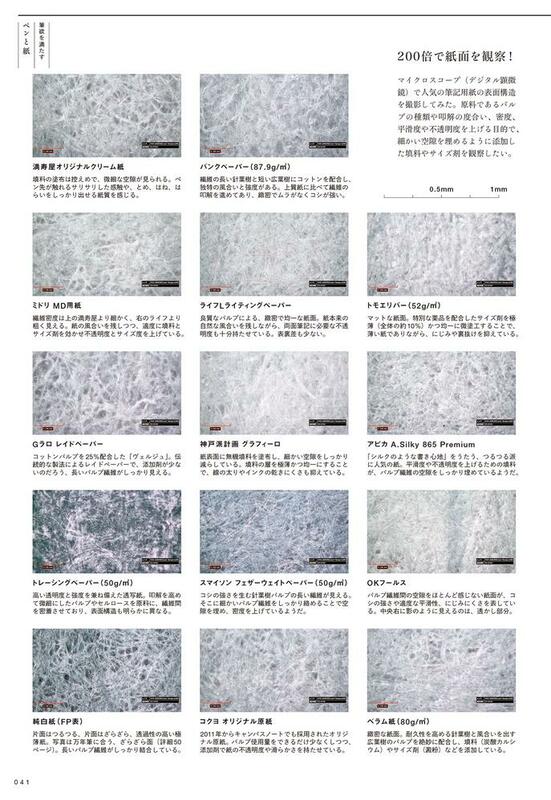 Shumi no Bungu Bako 35 has a special article on different papers, going into excruciating detail on their different properties and with examples of how different inks work with them. It has highly magnified views of the fibers for about fifteen different ones, and in one of the later pages, even a table with reviews of several different papers (notebooks) all used with the same different inks. 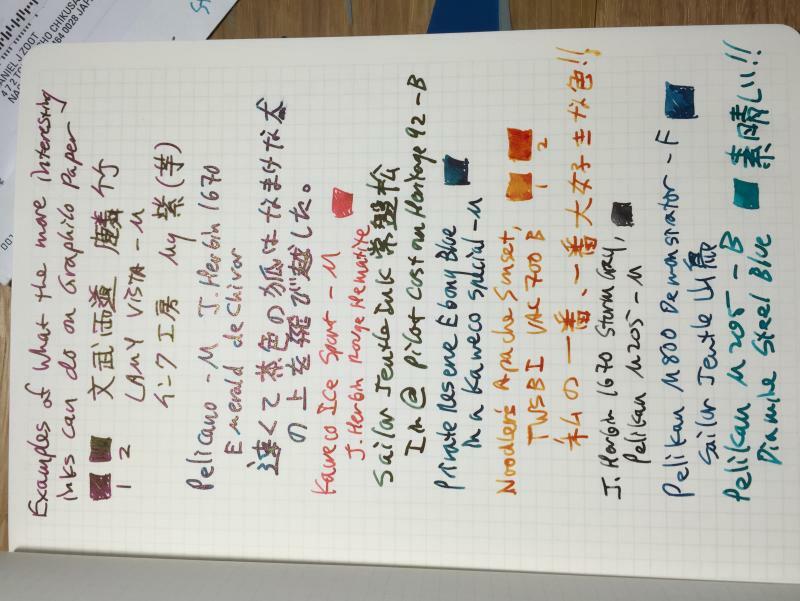 This is beyond the scope of my post, but just for reference, the "winner" of the ink and paper matching contest is Platinum Black with Tomoe River. This may not come as a surprise to some, but I have never used either of those, so it was lost on me. Back to Graphilo... In the Shumi no Bungu Bako article, there is a description of something called "Kobe Ha Keikaku Graphilo," [神戸派計画グラフィロ] which I assume to be same thing as the Graphilo notebook I got at Nagasawa. The blurb with the picture says that the paper is painted with an organic filler that dramatically reduces pores in the paper, and provides a uniform surface that prevents feathering and slows drying times. And viola, you get the kind of effects you will seen in my pictures. A shot of my test page taken from directly above. 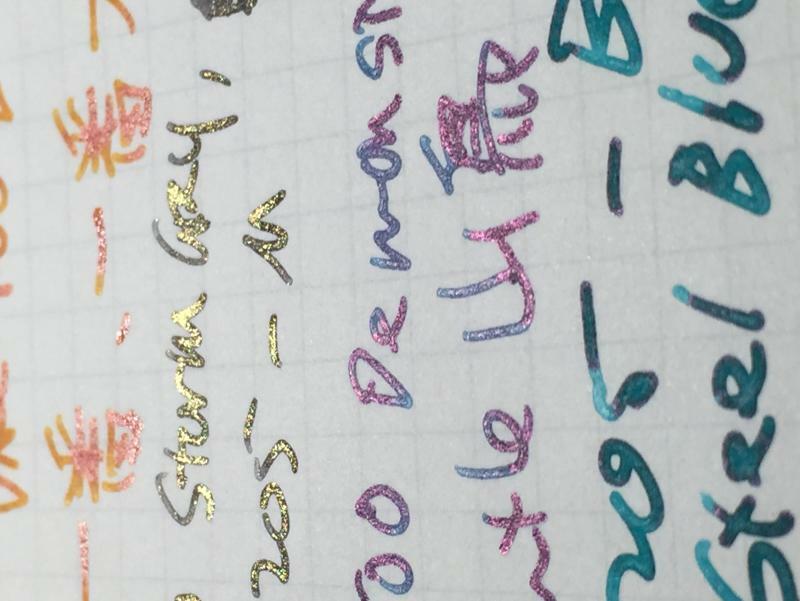 Close up views of the more interesting ink effects for "very much like" Sweet Potato Purple," Emerald De Chivor, Sailor Jentle Tokiwamatsu (which, holy mackelor, has some sheen properties I had not idea it had! ), Private Reserve Ebony Blue, Noodler's Apache Sunset (of course), and perhaps the second biggest surprise, Sailor Jentle Yamadori. I tried to find the Kobehakeikaku on Amazon.co.jp but it was all sold out. Anyone out there have any recommendations for papers with similar properties? Edited by Algester, 07 November 2015 - 13:06. I just recently purchased some of this paper. It's amazing. 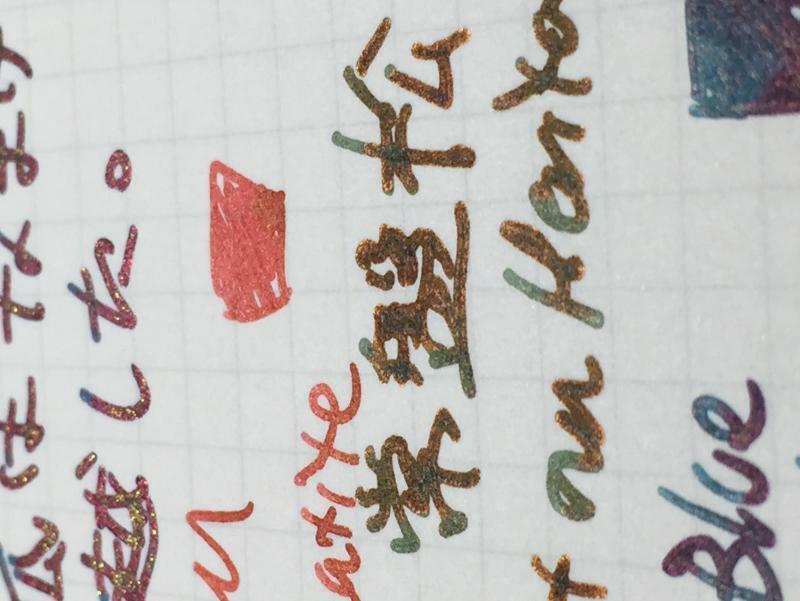 To me it's like a cross between Tomoe River + Rhodia. The GSM wasn't listed on mine but it feels about like the 68gsm Tomoe River. It's a very smooth paper but there's almost an eggshell-like texture as your pen glides across. Very subtle texture. And yes, the ink properties are displayed nicely. I'll probably keep looking for more of this paper; hopefully there are dense notebooks available. I love Graphilo paper! I went to the trouble and expense of ordering a notebook from Nagasawa through White Rabbit Express, but now you can get it in the US from Anderson Pens. It's every bit as good as Tomoe River. 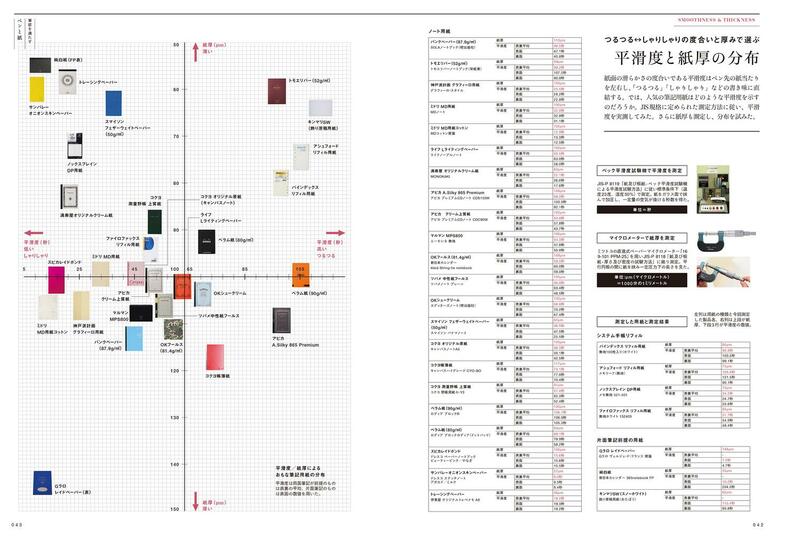 At present, they only have the A5 notebooks with 32 sheets, but I'm hoping they can get some of the larger notebooks in. I love Graphilo paper! I went to the trouble and expense of ordering a notebook from Nagasawa through White Rabbit Express, but now you can get it in the US from Anderson Pens. It's every bit as good as Tomoe River. Do you happen to know if they have any nice bound notebooks or anything closer to a Leuchtturm for example? The ones from Anderson Pen are great. I'm just looking for a bit more quantity. I'll look into White Rabbit. Yes, I agree with gerigo. There may be no ghosting, feathering or bleedthrough but Graphilo still isn't a good paper, at least for colour reproduction. All inks appear a tone or two lighter than the intended colour by the maker. My brown-green inks appear just green, my burgundy appears just some undersaturated dark red, blues appear washed out etc. I really liked the paper when I found it, but stopped using it as when I saw what it did to inks. What do the axes of the graph above represent? Sadly, there are some 'good' papers which do this. Rhodia Premium permits some inks, like Noodler's Liberty's Elysium to spread, so that my Fine nibs write like a Medium. 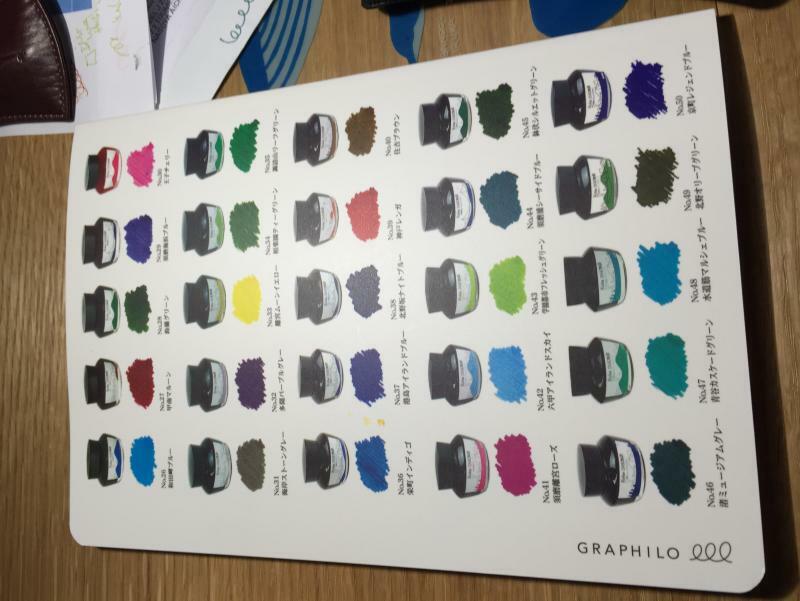 I have had another 'good' paper, Kokuyo Campus Refill paper, which makes some inks fade within seconds. Thank you, Algester. That's very useful to have. And the first time I've seen a paper graph. Edited by oregano, 09 May 2018 - 17:01.